This truss generates a large facing south roof and a second story inexpensively due to its modular nature. Photovlotaics are what has powered satellites for decades. Arranged in an array on the roof, typically they tie into your electric meter and turn it backwards when they generate power. With arrays as large as we can put on the house, you end up being a net power producer. That excess power can be used to charge electric vehicles further enhancing your savings, as electric cars are more than four times as efficient as gasoline powered ones. Our sun spaces are optimally narrow and isolated from the house via an interior wall and more for gathering heat on winter sunny days. The narrower space generates higher ceiling temperatures from which the heat is transferred to the house, charging it up on cold sunny days. Due to the roof overhang, the high angle of the sun in the summer, and no overhead glass, the sun space does not overheat in the summer. In the winter with a low sun angle temperatures are on the order of 160 degrees at the ceiling. This hot air is moved by fans through the house to charge it up. To retain and store heat in the house, mass is needed. Our optimal house has heated concrete floors which are tinted, polished, and sealed. Other mass strategies or floor coverings over the concrete are possible, if another style of flooring is desired. These concrete floors also recieve heat from the hot air of the sunspace via a heat exchange system that recovers the heat from the hot air to liquid which is then pumped through the floors further charging the house on winter sunny days. 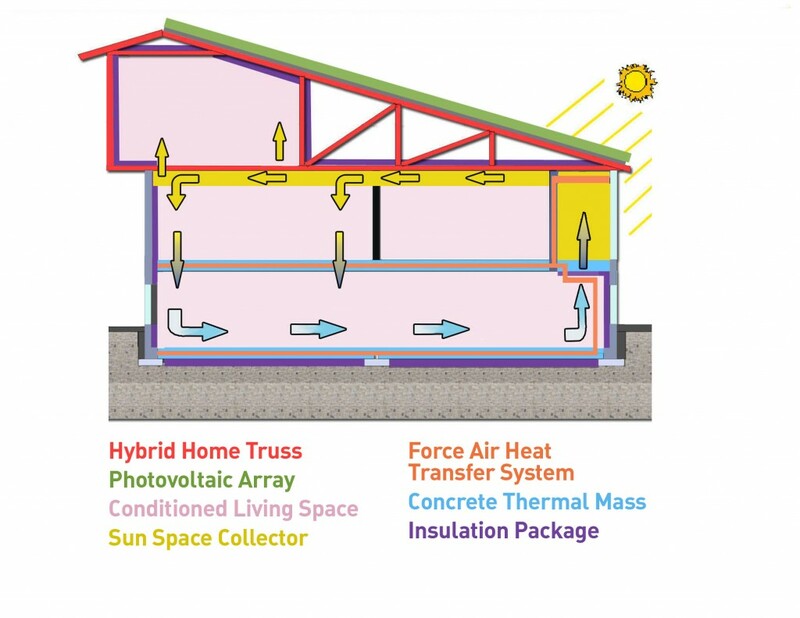 This patented system transfers the heat from the hot ceiling of the sunspace to the house and to liquid which is then pumped through a domestic hot water preheat tank and the concrete floors, charging them up to withstand cold nights and thereby generating warmer morning interior temperatures. Our six sided insulation package is typically double what building codes require. In the winter, It keeps the cold out and the heat in and is step one in achieving optimal performance. In the summer it keeps the heat out and the cool in! Simply open the windows at night and the house mass cools down to the night time air temperature. Close the house up during the day and it remains at that temperature! Air conditioning can be added, but typically is not needed. that can be accessorized with Photovoltaic or Solar Thermal collectors. much like a Hybrid Car, a term that is becoming increasingly well-known. energy tax credits, we believe now is the best time to Hybridize your home. Perhaps you have found a plan that you like and that suits your property. 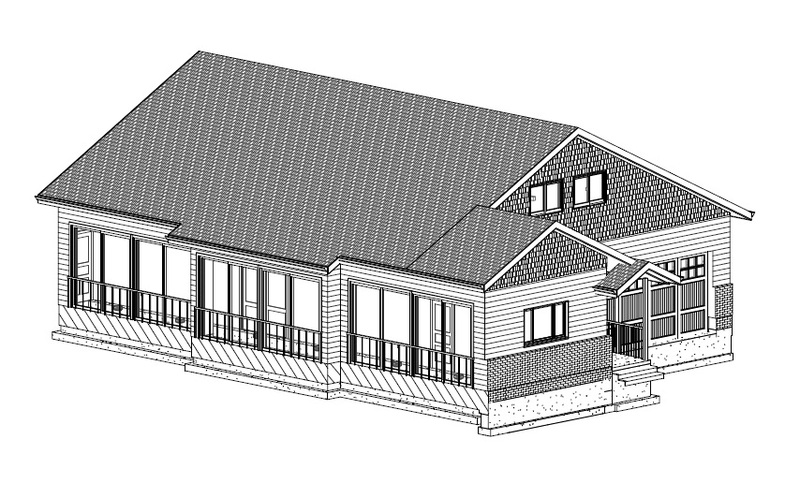 Similarly, we’ve collected many standard ranch plans that could be modified. Scaling everything to 1/8” and cutting the plans out, we could readily find a plan for any property with suitable solar access. 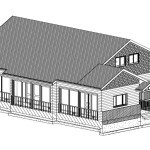 One possibility is your new Hybrid home could be a slab on grade Ranch with an unfinished attic as opposed to the old ranch with an unfinished basement. Hybridizing means you’ve got room-to-grow and energy to spare. Please contact us for advice on how to get the most out of your design.